Robotics, drones, creative playthings and family-inclusive toys and games will be among the top toy trends of 2016, according to experts at the U.S. Toy Industry Association (TIA). The trade group announced this year's hottest trends in toys and play during a packed seminar held this afternoon for media and buyers at TIA's 113th North American International Toy Fair. "This year, the toy box will be filled with products from both ends of the spectrum. From high-tech toys to classic and outdoor-based products, there's something for each child's interests. The best toys hitting the market are ones that challenge kids and foster their development, all while maintaining an element of fun," said Adrienne Appell, TIA trend expert. "While the focus is on kids, what's noteworthy is that many elements of these toys and games encourage parents to join the activities." "Toys are the tools of play, and the exciting trends and toys we are seeing here today will foster endless hours of meaningful and fun play," added Ken Seiter, TIA VP of Marketing Communications. Leading up to Toy Fair, TIA's experts collaborate with hundreds of global toy companies to identify the products and trends that will drive consumer spending on play. The toys, games and youth entertainment products shared at the trends briefing made their Toy Fair debut and will appear in stores through the holiday 2016 shopping season. In the air and on the ground, drones allow kids to do amazing things, like control multifunction nanodrones and launch them from the palms of their hands. The hottest robots of the year will be customizable and teach kids important concepts, including coding, engineering, problem-solving and building. Younger children will also find them as, or with, their action figures, puzzles and bath toys. The Toys-To-Life mash up innovative and affordable technology with traditional toys to provide a truly 360-degree interactive play experience. As tech continues to innovate we are seeing the enhancement of classic play patterns, in many different toys and categories. Includes: robots/robotic pets, RCs that interact with smartphones, apps that allow kids to play with physical toys in new and different ways, smart tablets for toddlers, augmented reality, wearables, flying nanodrones, etc. Millennial parents have grown nostalgic for their own childhood board games, puzzles and other traditional toys, and want to share in those unplugged experiences with their children. We are also seeing a growing number of toys that incorporate technology while also promoting socialization, face-to-face interaction, and family bonding for all. Whether online or offline, these toys help bridge the gap between generations by helping families create lasting memories through play. Includes: family and board games; craft activities; outdoor games; etc. Elaborate culinary concoctions, Pinterest-worthy designs, and stop-motion movies are just a few of the many creative projects that the "Ultimate Creator" will be found working on. Toys and crafts under this trend teach children to skillfully cook, design, build, grow, and create physical and digital masterpieces that they can proudly share with family and friends. Many teach techniques and skills that can be applied throughout life – including videography, sewing, dip-dyeing, crocheting, watercolor painting, laser cutting, embroidery, and more. Includes: stop-motion technology and videography sets; food and baking sets; jewelry making, building sets, etc. Educational toys are "STEAMing" ahead, and toys that teach or reinforce Science, Technology, Engineering, Arts and Math (STEAM) continue to be top contenders in the toy market. Parents and educators appreciate these toys because they help prep kids for school by building important spatial, reasoning, critical thinking, and problem-solving skills. "Brain-boosting" playthings that fall into this trend also encourage kids' proficiency in subjects beyond STEAM, such as language and history, and support children as they grow and gain new abilities. From enhancing kids' communication skills to improving their logic, the latest cohort of educational toys encourage kids to explore, experiment, design and discover … all while having fun! Includes: classic toys with an educational twist; infant/pre-school learning toys; science and engineering kits that teach coding and advanced mathematical concepts; activity-based books and educational board games that teach language and culture; toys that encourage parental/educator involvement and teaching; etc. Collecting has long been a favorite pastime for children, but in 2016 you can expect to see these affordable and/or coveted toys everywhere. Collecting is an art form for kids who are on the hunt for the perfect item to complete their set. For other kids, collecting is all about socialization – they love to share and trade characters, pets, cards and other minis with their friends. Collectibles teach children patience and perseverance (due to "the hunt"), organization, and negotiation skills (when it comes time to trade). Includes: novelty toys; high-quality miniature versions of existing lines; franchise collectibles; etc. 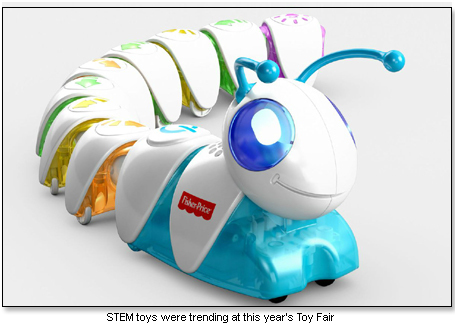 Additional information about these trends is available on-site at Toy Fair in the Press Center (through 4 p.m. on Tuesday, February 16 in the South Concourse, above Hall E) or via e-mail to the TIA public relations contact listed on this release. A video of today's presentation can be viewed on the TIA website. Visit www.theGeniusofPlay.org to learn about the amazing benefits of toys and play.